A handful of dressed green salad (optional). In a large non-stick frying pan, heat 1 tbsp olive oil and 25g butter. Gently cook ½ leek, washed and thinly sliced, and 1 clove garlic, crushed, for 2–3 minutes until just beginning to soften. Add 1 small courgette, trimmed and cut into thin strips. Cook for a further 2-3 minutes. Stir in 250g raw tiger prawns (from the fish service counter) and cook for about 5 minutes, stirring frequently until the prawns turn completely pink. Stir in the finely grated zest and juice of a lemon, a pinch of dried chilli flakes (optional), and season generously with black pepper. Cut ½ Waitrose Olive Ciabatta in half through the centre and toast until golden. 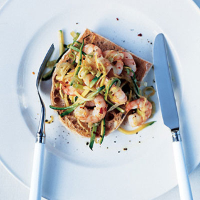 Spoon the prawn and courgette mixture over the toast and serve with a handful of dressed green salad (optional).